Late last year – with funding from the Thematic Working Group on Fragile and Conflict-Affected States – we were able to run two workshops in Liberia to better understand the impact of the Ebola outbreak on the different levels of the Liberian health system, at national, county and community levels. Our consultations took place in Monrovia and Buchanan in Grand Bassa County. Through these dialogues we captured the views of a variety of stakeholders: education and training institutes, implementing and funding partners; key ministries involved in the delivery of health interventions; county health officers; community health department directors; general community health volunteers (gCHVs); community drug distributors; community leaders; and women’s and youth group leaders. The meetings provided learning on each of the health systems building blocks. Stakeholders felt that inter-sectoral working, for example collaboration amongst the ministries of Education, Agriculture and the Ministry of Health, is important in moving the country forward and rebuilding systems post-Ebola. Involvement of the county and community levels of the health system in post-Ebola planning was considered crucial. Some stakeholders felt that there could have been better coordination at the county level during the outbreak. Many spoke about the crucial role of gCHVs who were described as overburdened and pulled in the direction of the many (competing) disease programmes. Moving forward some suggested that gCHVs should be seen as another cadre of the health workforce and/or frameworks for incentives should be developed. There was concern amongst some participants that the Ebola outbreak had diverted donor attention and resources away from other diseases and health systems activities. Over-reliance on NGOs and external funding agencies to support activities associated with health programmes was considered problematic. Some felt that Ebola highlighted a lack of planning within county health team budgets and work plans for activities associated with vertical programmes which could be improved as we move forward. High turnover of personnel in the Ministry of Health was seen as a critical problem as it led to under staffing and overburdened workers. At the county level, participants felt that there was an ongoing overstretching of disease focal points and other health staff that was exacerbated during the Ebola outbreak. This is likely to continue given the high numbers of health staff lost to Ebola. This impacts on staff motivation and retention at the county level. Staff also left because they were not always paid on time. Participants felt that the Ebola outbreak exposed areas of weakness in health workforce training which emphasizes the need for continued professional development. However, it also led to rapid learning about hygiene and screening procedures, allowing staff to become more equipped to manage communicable disease in the future. gCHVs played a significant role in Ebola surveillance at the community level. As a result they received more focused, regular supervision from the county health teams than previously. The Ebola outbreak put a strain on resources and participants observed frequent stock-outs of essential medicines at the village health centre level. Participants thought this suggested a need for improved supply chain mechanisms that are more resilient in times of crisis. Stock-outs were thought to be gradually decreasing with the most common drugs now regularly being sent. Some participants felt that there was poor quality drug management at county and community levels and that there is a need to put in place transparent drug procurement, storage and monitoring processes. Participants felt the Ebola outbreak led to the provision of better equipment to manage communicable disease epidemics. Protective clothing and the development of triage and isolation points were referred to. Many stakeholders felt that a key priority post-Ebola was to update facility catchment information as well as to have more detailed statistics regarding the population and disease profile within these catchment areas. Many felt that re-mapping of disease prevalence would be necessary post the Ebola epidemic as numerous diseases were likely to have faced set-backs in their control during the crisis. gCHVs explained that the data collection ledgers that they are required to record information in at the community level are over complicated and difficult to use. They felt that simpler, more streamlined, processes could help ensure consistency across the health system and programmes. Improved population statistics would make planning, monitoring and evaluation easier and more consisent. Stakeholders noted that there had been a decline in the uptake of services since Ebola. This was perceived to be due to a two way break down in trust between communities and the health system. At the community level, people were afraid to go to health facilities because they were afraid of contracting Ebola. When they did access services, there were insufficient medicines and personnel had been diverted to manage the crisis. 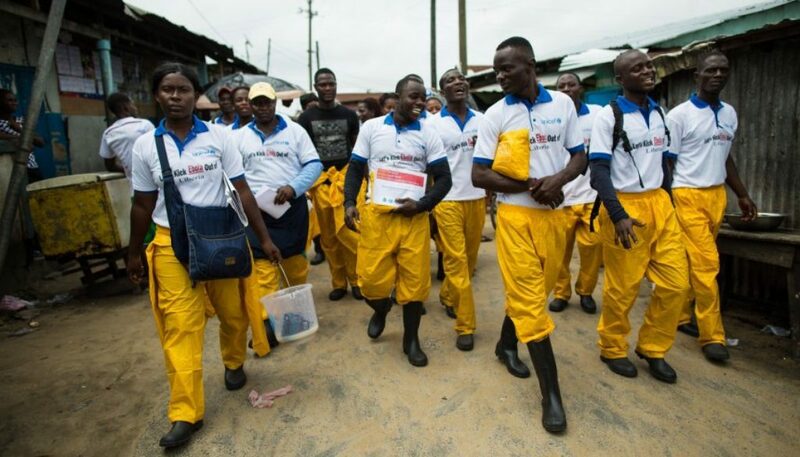 When interventions were taken to the communities, community members thought that health personnel were ‘bringing Ebola’. Health workers, also lacked trust in the community. This has resulted in morbidity and mortality due to diseases such as Malaria, TB etc. It has also resulted in a reduction in the coverage of preventative activities such as immunization and Mass Drug Administration for NTDs. Participants felt that the Ebola outbreak had emphasised the importance of disease dynamics between urban and rural settings suggesting that further thinking was needed about how to adapt service delivery for different contexts. Logistical challenges in accessing communities that are particularly remote and sprawling were identified. gCHVs found moving through these areas was timely and costly and felt that the provision of bikes or motorcycles would help in accessing these harder to reach areas. Meeting places such as schoools – where gCHVs could normally access large segments of the population to deliver interventions – were shut down during the outbreak or people were too afraid to attend. Participants felt that there were strong structures at the community level that they could work with to develop effective social mobilisation. This needs to happen before (and not at the same time as) the provision of medicine or other interventions. Participants felt that by re-establishing and evaluating strategies that were successful prior to the outbreak and making comparisons across disease programmes and the health sector, stronger creative approaches could be generated. The stakeholder mapping taught us a great deal that can be used to inform the roll out of the NTD programme over the coming months and provides Liberian stakeholders with some suggestions of areas of work that need to be strengthened. A full record of the meeting will shortly be made available for those of you who would like to learn more.